This post was previously published on my COETAIL blog as part of a five courseCertificate of Educational Technology and Information Literacy. I am so inspired when I sit with a colleague at lunch (as happened recently) and they recommend the ideas and passions of their former colleagues and it turns out they and I have long been connected, virtually. I have stopped expecting someone else to take care of my professional development and I am dedicated to ‘passionately pursuing’ my own growth. From links to articles, to ideas on lesson plans, my Personal Learning Network is a real time professional development network of educators that I rely on to help me do my job as an educator. –Jeff Utecht REACH, p 10. I agree with Jeff wholeheartedly although I would go so far as to define ‘educators’. I was intentional in the way I set up my Facebook and my Twitter accounts (although the lines in Facebook are becoming more blurred as educational organizations like Edutopia,Mind/Shift, Making Thinking Visible, and various PYP groups are pushing a more visible presence on Facebook). My intention was to keep Facebook for keeping up with friends and family and Twitter for education and educators. And authors. And humanitarians, poets, activists, innovators, ruckus-makers, and disruptors. I made a conscious decision to not follow friends who tweeted about their coffee/dinner/workouts. I love these friends but Twitter was my sacred ground for teaching and learning. I started my blogging life with a blog that was a little bit of everything – personal, professional, cooking, crafting, photographing. Then I found myself leaning more toward the education side of things, buoyed by comments from friends and parents of children I was teaching or had taught. This blog evolved from there. I wasn’t sure if I had anything to say but I blogged anyway. When Jeff talks of the time it takes to develop a PLN he is spot on. There have been times over the course of the past two years when I have felt like quitting the blog. Who would miss me amongst the excess of 200 million blogs already in existence? So I eased off and then I stopped (and had a baby) and then I got going again because I missed not being connected. Dads are great, right? But he touches on the same issue that Jeff mentions: blogging when no one is looking (or reading). My stats indicate that I have a lot of ‘lurkers’ and I would confess that I too, am a lurker at times. But when I get out there and post and comment and respond, that is when the learning happens. 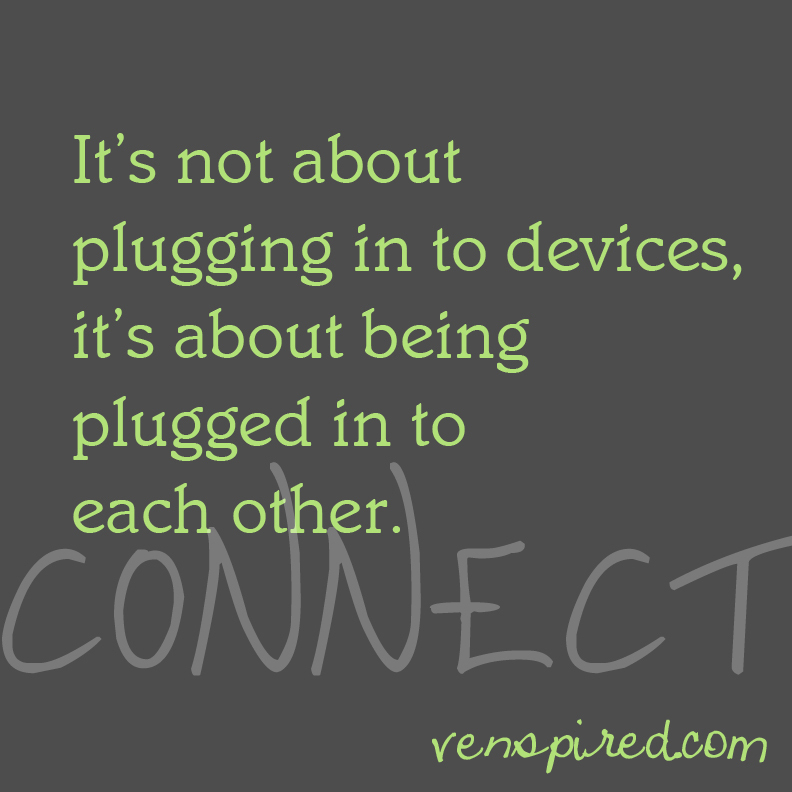 Who are you plugged in to? How do you connect with other educators? 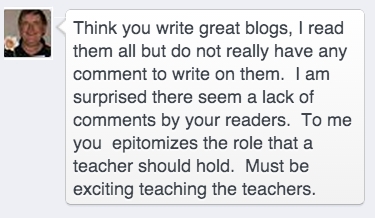 Sonya, I’d certainly notice if you stop blogging, your posts are educational highlights in my week. Though I must confess to being somewhat a lurker. Though not entirely through choice, mostly lack of time, or should I say lack of time I have chosen to carve out for this. I was slow to Tweet because I didn’t think I could fit one more connection into my life (I don’t use FB, I know I don’t have the time for that). But like most things in my life (exercise being top of my list at the moment) I know that once I strive to make the change and give it the time it deserves, I can stop lurking, I can start leaving comments and letting you know your voice has been heard and has been an inspiration. Which is quite rich coming from me, as I am almost at the stage of begging our parents at school to leave even the shortest of comments on blogs, which their children’s teachers have crafted with so much care, knowledge, thought and positive intent. And I guess I just need to ‘get over’ my other issue….basically that I fear being slighted by other bloggers (as has happened on occasion with Twitter, which knocks my confidence a bit – felt a bit like bullying to me). 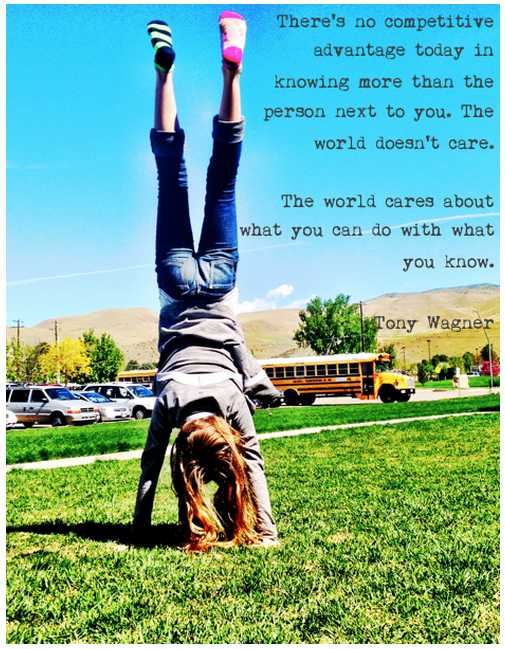 In summary, “In a gentle way, you [can] make a difference” – thank you, Sonya. Thank you, Paula. I really appreciate your feedback. It is unfortunate that you have had negative experiences with sharing online. I think some of the digital etiquette we try to instil in our students could also be heard by teachers. I used to worry that I was too opinionated but I like the opportunity to express my ideas and welcome the feedback from others. If I upset or cause a reaction in others at least we have started a conversation, right? It is one of the things I look for in a great leader – someone who provokes, who pushes ideas out into the universe, who challenges my thinking. I don’t always agree with their ideas but I do appreciate the opportunity to examine my own thinking and to learn from a different perspective. Finding balance is also a big one for me. Always something to work on! Sonya—you know how inspiring I find your posts. I think though even without inspiring so many of your readers, don’t you find the act of blogging an important curation step which gives you better insight into what you do and why you do it? Somedays a blogpost can be a song sung in the shower–brightening your morning just for the sake of starting your day right. Other days your blog becomes a conference hall, hosting and stirring up ideas. Blogging is an act of listening as well as speaking. Absolutely! More often than not, I just want a place to store all the cool stuff that comes my way and on top of that, I think out loud about what the ‘thing’ means to me. I really enjoy it too, which is a bonus! Thanks for your constant cheerleading. There are many times when I find myself thinking “Tricia would love this” which is always a good sign that I have found something awesome! Let’s keep talking about the Euro conference – sounds fab.